TsukuBlog | Leaves Fall Away- Sometimes Revealing the Shrikes`Macabre Handiwork- MOZU NO NIE (鵙の贄)- Tsukuba`s ( and Japan`s) Shrikes- birds with a very curious habit! Since LIFE somehow first came to be generated in the primordial cosmic soup, it has taken on countless shapes and forms. Competing for nutrients and shelter, living creatures have fanned out to occupy every possible niche, from deep under the sea or under the ground, to high up in the atmosphere and everywhere else in between. In the struggle for species survival it has also happened that each creature has developed its own unique behaviors with all possible time and seasonal slots being taken up by the various activities of these organisms. The result is a natural world so diverse and AMAZING that many have been (and some even still are!) tempted to conclude that this could only be the work of an intelligent and omnipotent being. For the Japanese, autumn had always been a time to admire some of the animal world’s most awesome spectacles. The aristocrats of the Heian Court composed some of their greatest poems on the migrations of KARI, wild geese, and of course the non-Yamato inhabitants of Eastern and Northern Japan were filled with religious awe with the mysterious return of salmon (like manna from heaven for them) to the rivers and streams where they were spawned. In today’s Japan, we unfortunately have little opportunity to observe these phenomena. In all my years of birdwatching here, I have never seen a LARGE FLOCK of geese. In contrast, I am often saddened by the lonely sight of a solitary duck flying off on what looks like a solo migration. As for salmon, pollution, dam construction and overfishing have reduced the upriver runs of autumn to a mere shadow of what they once were. 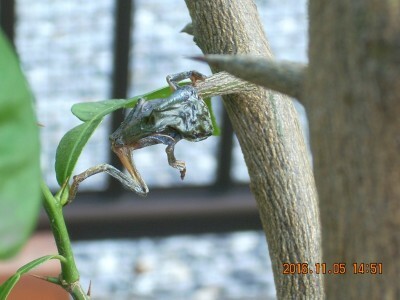 In Tsukuba (as well as most other parts of Japan) one UNIQUE and startling form of animal behaviour can still be encountered in late autumn, though in fact the animal involved actually performs it in early fall. It is only when the foliage falls away, however, that evidence of this creatures activity is revealed. I am talking about the MOZU (鵙 ) or (bull-headed) shrike, which because of its startling (for us) habit is often called the BUTCHER BIRD. 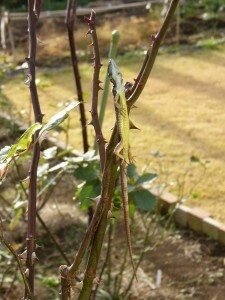 What the MOZU does is impale its prey on thorns or the tips of branches. In my neighborhood, the most common victims are lizards, though I have heard that frogs, grasshoppers and other insects can be found hanging out to dry in people’s gardens. 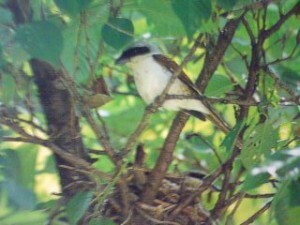 I have also seen photos of mice and sparrow chicks which have been skewered by these birds. Actually coming upon these macabre leavings can be upsetting. 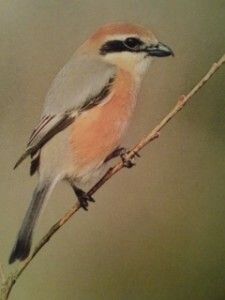 The phenomenon has made a strong impression on the Japanese and the expression for the impaled prey, MOZU NO NIE (the shrike’s sacrifices) has become a KIGO, or seasonal keyword for Japanese HAIKU poetry. Ornithologists are not exactly sure of why shrikes do what they do. There are several theories. 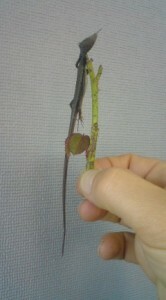 They do it to preserve food to be eaten later (the leavings are never come back to in my garden). They do it to mark out their territory. Or, most logically for me, they use the thorns to pin their prey while they rip off pieces with their sharp curved beak (shrikes it seems have weak legs). Whatever the reason for this behaviour, the MOZU NO NIE　(or mozu no hayanie) can’t help but fill one with amazement with the fast disappearing natural world around us . Or have a look at more OFFERINGS at this site. Just keep scrolling and clicking away at the links. The Alien Scientist – now online!